Zurichs department of civil engineering took the opportunity to acquire mobile bicycle stands which were produced for the Expo 2002. They have been used successfully by the Zurich Theatre Festival since 2003. Now the bicycle stands are also be made available for other big events. 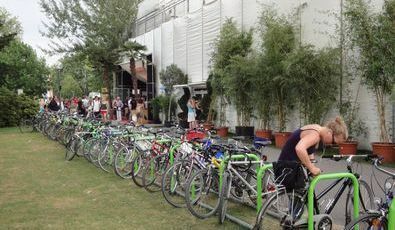 When planing big events, organizers usually consider the problem of huge numbers of cars and parking places but rarely think about people arriving on bikes. Just think about the consequences of hundreds of bicycles cluttering pedestrian areas or accesses. The City of Zurich`s mobile bicycle stands have proved to be a reliable and comparatively cheap solution to that problem. The system of mobile bicycle stands consists of vertical u-shaped stands connected by tubes that can be screwed to the ground. The material including screws comes in boxes containing 20 stands each. Safety measures such as correct and sufficient fixation have to be taken according to the local situation. In total the department of civil engineering acquired 235 stands. Usually there is no charge for hiring the racks. Event organisers are only charged for the manpower of the people delivering and installing the bike stands. The renting out is organised through a cooperation between the Social Department and the Department of Public Works. In 2011, the offer is still available and many event organisers appreciate the offer. The Department of Public Works seeks to cooperate with event organisers in order to communicate about campaigns and to advertise cycling, walking and public transports as sustainable means of transportation. The experiences so far are good. Offering mobile bicycle stands is usually accompanied by information and messages through the internet (organiser’s homepages and/or the Department's website), posters, articles within newsletters, distribution of flyers and the like.